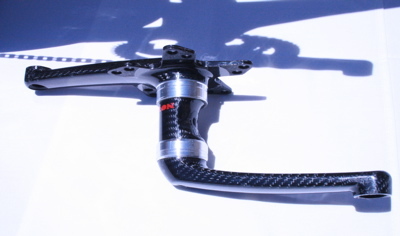 For 2009, LOOK Cycle wants the world to know their mastery of carbon fibre bicycle technology. Though less than thirty years old as a bicycle manufacturer, the history of the French company is virtually that of the carbon fibre bike. From the first Tour win on a carbon frame to the mountain of Olympic medals, the iconic four-letter font has been everywhere there have been carbon bicycles. This coming year, LOOK offers three different methods of carbon construction, bringing both a new flagship and an aggressively priced competitor for the entry-level. Besides their road bike line, they also add to their triathlon/TT and mtb offerings. Throughout the line, LOOK emphasizes the practical elements of design as equal to innovation. The new Look 586 road bike. The 595 lugged carbon fibre frame system. There are essentially three ways to fashion carbon fibre into a bicycle frame. The first method, the one upon which LOOK established itself as a manufacturer, is to bond pre-formed carbon fibre into lugs. Since this was the method that was used by Look since their debut , there has been the perception that the lugged method represented outmoded technology. On the contrary, LOOK believes that lugged construction allows them to precisely tune the ride through careful tube selection and construction. Additionally, they introduced carbon lugs that are moulded under high pressure (up to 250 Bar) to make them incredibly strong yet light. The LOOK 595 road frame is the company’s top lugged bike, designed specifically for the demands of professional riders. The first frameset with carbon lugs, the 595 brings in an oversized, tapered steerer tube and LOOK’s innovative integrated seatpost system, the E-post. Total weight for the frame with uncut seatmast, fork, and E-post is around 1600gr. Additionally, an œUltra version of the 595 is offered that features a different carbon lay-up for the complex-shaped tubes that boosts the stiffness by 15% for stronger riders and sprinters. The 595’s little sister is the 585, sharing similar construction but without the proprietary fork and E-post. The second method of carbon construction, monocoque or as LOOK would say œmonobloc, eschews individual tubes and lugs to form the frame in one mould (œfull monocoque), or perhaps to two or three. This method allows the famously curvaceous shapes closely associated with modern carbon frames, but the cost and complexity of the moulds are difficult obstacles to overcome. 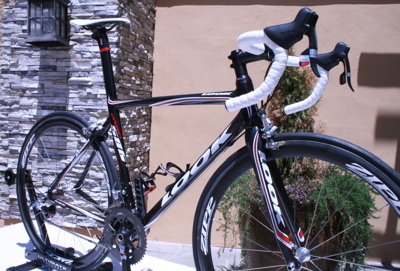 For 2009, LOOK introduces their top monobloc road frameset, the 586. Sharing the same fork and E-post of the 595, the 586 brings cleaner lines and lighter weight (about 1500gr frame/fork/E-post, seatmast uncut). Also utilizing monobloc construction is the 566, an aggressively priced road frame targeted at century riders, gran fondo, and club racers. With innovative tube shaping designed to reduce weight and improve ride comfort without compromising lateral rigidity, the 566 is offered as a complete bike with SRAM Rival for $2,499 and Ultegra SL for $2,999. The 566 has a slightly taller cockpit and a fork designed for comfort. Available in 5 sizes (1100gr for size M frame plus 350gr fork), the 566 is a bold move by LOOK to seize a foothold in the entry-level carbon road market. The 996’s carbon with aluminium linkage rear suspension. The third method of carbon construction involves mitering the carbon fibre tubes to fit directly to each other and then laying additional carbon fibre over the joints. This method is referred to as tube-to-tube, or in the French company’s parlance: œT2T. As of yet, LOOK Cycle is not well known for their mountain bikes but aims to change that. The new 996 features a full monobloc front triangle with a virtual pivot-type rear suspension giving 100mm of rear travel. 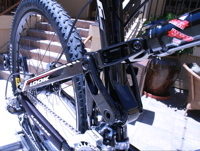 The carbon with aluminium linkage rear suspension minimizes pedal bob without the need for a lock-out. 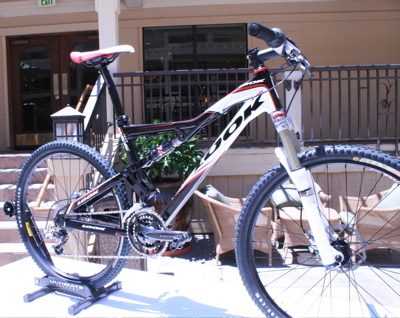 Look is targeting the marathon and X-terra competitors with this lightweight (2500gr frame with rear shock) racer. At the cutting edge of hardtails, the 986 utilizes both monobloc and T2T techniques. Featuring the E-post system from the 595, the 986 frame weighs in at about 1420gr with E-post and uncut seatmast. With French mtb star Miguel Martinez winning Sea Otter and going to the Olympics on Look frames, expect to see more Look in the dirt this year. 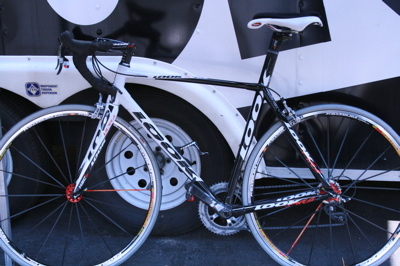 At the recent LOOK product launch in Los Gatos CA, I had a chance to look over their 2009 bikes and ride a 595. In the coming days, I’ll talk a little more about the Look technologies such as their œE-post integrated seatpost system and my ride impressions of the 595. But I’m really keen about the mind-blowing 596 time-trial/triathlon frame system, LOOK’s pinnacle of cycling technology. The discussions I had with Look’s staff about aerodynamic testing and design touched on some of the exact issues I had been talking about in previous articles about aero wheels. And you’ll want to know about this too. It’s called the Monobloc Zed crank.